SUTTON UNITED moved to the top of the National League after securing a 3-2 win over Chester at Gander Green Lane. James Akintunde and Harry White scored both of the goals for the Blues, who scored both their strikes when being two behind. Marcus Bignot made two changes to the side who drew 0-0 with Aldershot Town last time out. Ross Hannah, who joined Southport on loan, and Jordan Archer, who drops to the bench were replaced by Harry White and James Akintunde. Andy Firth saw himself called into action within the opening ten minutes when the on-loan Liverpool pulled off a remarkable reaction save to deny Tommy Wright. After already netting 11 goals this season, Wright looked to add to his tally, but Firth stuck out his leg to push the ball away for a corner. Just moments later and the U’s found themselves ahead. Wright turned provider on this occasion, as he fed a ball across to Harry Beautyman, which allowed the 25-year-old to steer his strike beyond Firth and score his first goal during his second spell at Gander Green Lane. James Jones, fresh from his England C debut victory over Wales on Tuesday evening, remained calm and composed despite the offensive onslaught from the home side. The 19-year-old’s excellently timed last-ditch tackle on Tom Bolarinwa prevented the tricky winger from getting in behind the Blues defence to net a second for the U’s. But soon after, the visitors headed into the interval two down after Sutton managed to stab home following a melee in the six-yard box. Ross Stearn whipped in a corner towards the far post, and with neither side able to keep hold of the ball, on-loan Barrow striker Byron Harrison poked the ball past Firth, who was helpless from four yards. 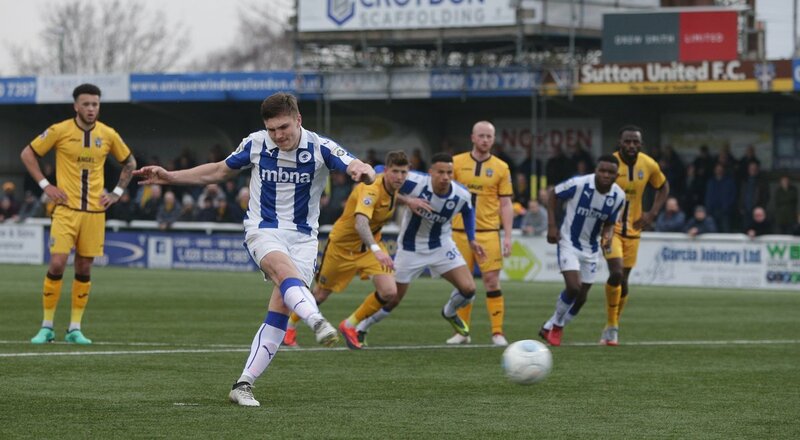 The Blues failed to muster up a shot at goal during the opening half and did not look like creating anything of any threat as Paul Doswell’s side continued to sit firmly in the driving seat. However, Bignot’s men came quicker out of the blocks in the second half and reduced the arrears with an hour on the clock. Gary Roberts lofted in a free kick in towards Ryan Astles after James Akintunde was tripped 40 yards from goal. The Blues captain rose the highest to nod the ball down for Akintunde who poked the ball past Jamie Butler. Just ten minutes from time, Sutton restored their two-goal cushion after an excellent strike from substitute Ross Stearn. The winger, also on his second spell at the club, shifted the ball onto his right foot to curl his effort into the top corner beyond Firth. Sutton looked as if they were walking to three more points, but with four minutes remaining Dean Beckwith tripped Akintunde in the area, and referee Sam Allison pointed to the penalty spot. Harry White stepped up to take and placed the ball beneath Butler to add yet another for the visitors. Despite a late spell on pressure from the Blues, who were arguably the better side in the second half, Sutton United secured the win, which sees the U’s leapfrog Macclesfield Town at the top of the table. Chester FC: Firth, Hobson, Jones, Astles, Anderson (Rowe-Turner 46), Halls, Roberts, Crawford (Mahon 77), Akintunde, Vose (Archer 77), White.